The eel hound is a large, amphibious lizard that exhibits the ability to swim and run very quickly. It is at least eight feet tall and roughly twenty-five to thirty feet long with dark green scales (except along its ventral side) from its jaw to its tail. The eel hound is green in color with a lighter shade on its underbelly, and a darker shade of green on top of its body. Being so large, they are easily able to carry multiple people, as seen in the image above. They are shown to carry 3 people at least, as Suki and Toph are shown in the image above, and Sokka later mounts. While the fastest on land, in the water they are still fastest, moving at speed-boat speeds. However, unlike their smaller, jungle dwelling cousins the dragon hounds, the eel hounds lack any extra abilities or enhanced senses, disregarding such things in favor of sheer speed. After all, it doesn’t need special abilities or to fight if it can run and swim faster than any other known animal. Due to it’s sheer size and amphibious nature, it’s range is more restricted than it’s smaller cousin, and it can’t go to the poles, it’s large size contributing to it’s quicker heat loss, due to a larger surface area for heat to leave, inhibiting it from very cold regions. Even the eel hound has limits to endurance, and going at it’s max speed will require breaks for resting. 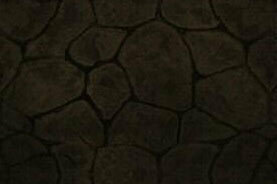 They are also not commonly used as pets or mounts, due to it’s wild and hard to train nature. The eel hound has no abilities beyond it’s size and speed. The eel hound is a large, amphibious lizard that exhibits the ability to swim and run very quickly. It is at least eight feet tall and roughly twenty-five to thirty feet long with dark green scales (except along its ventral side) from its jaw to its tail. The eel hound is green in color with a lighter shade on its underbelly, and a darker shade of green on top of its body. Being so large, they are easily able to carry multiple people, as seen in the image above. 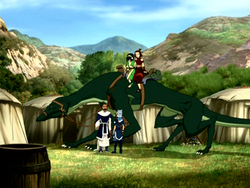 They are shown to carry 3 people at least, as Suki and Toph are shown in the image above, and Sokka later mounts. While the fastest on land, in the water they are still fastest, moving at speed-boat speeds. However, unlike their smaller, jungle dwelling cousins the [url=http://bendthis.forumotion.com/t452-dragon-hounds]dragon hounds[/url], the eel hounds lack any extra abilities or enhanced senses, disregarding such things in favor of sheer speed. After all, it doesn’t need special abilities or to fight if it can run and swim faster than any other known animal. Due to it’s sheer size and amphibious nature, it’s range is more restricted than it’s smaller cousin, and it can’t go to the poles, it’s large size contributing to it’s quicker heat loss, due to a larger surface area for heat to leave, inhibiting it from very cold regions. Even the eel hound has limits to endurance, and going at it’s max speed will require breaks for resting. They are also not commonly used as pets or mounts, due to it’s wild and hard to train nature.